Western Digital introduced a new line of VelociRaptor HDDs, these 10,000RPM HDDs feature a SATA 6Gbps interface and are available in capacities of 250GB, 500GB and 1TB. The disk has a 2.5" form factor but it housed in a 3.5" mounting frame with built-in heatsink. The new VelociRaptor HDDs will ship for $159.99, $209.99 and $319.99, respectively. Western Digital® (NYSE: WDC), today announced it is now shipping the new WD VelociRaptor® 1 TB hard drive, the latest addition to its award-winning drive family, the largest capacity 10,000 RPM hard drive on the market today. Designed for high-performance PCs, Mac® computers and professional workstations that require a balance of high performance and capacity, the WD VelociRaptor drive is a favorite among enthusiasts and creative professionals. The WD VelociRaptor will also come in capacities of 500 GB and 250 GB. Leveraging enterprise-class mechanics to provide 24x7 durability under high-performance workloads, the new WD VelociRaptor 1 TB hard drive is geared for creative professionals who demand the ultimate SATA drive. Creative pros use write-intensive applications that manage large, dynamic files; for example, video editing and digital content creation and management, which ultimately put a strain on storage devices that utilize write-challenged NAND memory for performance enhancement. WD VelociRaptor's outstanding read and write performance across the entire disk capacity makes it a perfect match for the creative professional and enthusiast who want to optimize their tools, enhance productivity, and increase storage space at the same time. 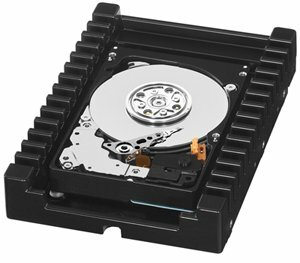 The WD VelociRaptor 2.5-inch hard drive comes in the IcePack™ enclosure, a 3.5-inch mounting frame with built-in heat sink - a factory customization that fits the drive into a standard 3.5-inch system bay and keeps the powerful drive extra cool when installed in a high-performance desktop or workstation system. Rotary Acceleration Feed Forward (RAFF™) - Optimizes operation and performance when the drives are used in vibration-prone, multi-drive chassis. NoTouch™ ramp load technology - The recording head never touches the disk media ensuring significantly less wear to the recording head and media as well as better drive protection when in transit. WD VelociRaptor hard drives are available now at select distributors, resellers and e-tailers, and come with a five-year limited warranty. Manufacturer's Suggested Retail Price (MSRP) for the WD VelociRaptor 1 TB (model #: WD1000DHTZ) is $319.99 USD, the 500 GB version (model #: WD5000HHTZ) is $209.99 USD and the 250 GB version (model #: WD2500HHTZ) is $159.99 USD.